YES I know it's already 2015 and I'm just posting my December 2014 Instagram photo diary. I totally overlooked my blog post since I promised to alternately post food, fashion & travel to all you guys. Well, December will always be the best month year-ender for me. Aside from Christmas as my most awaited holiday of the year, December also means a lot of birthday celebrations, company dinner, and solo travel in my case. It was the time I'm mostly outside, having dinner with friends and enjoying staycations with loved ones. So here's my photo diary for December 2014 and I hope you love it guys. Cheers! Earlier this year when I went back home in Manila to celebrate my birthday with family, we stayed in Remington Hotel located in Resorts World Manila. We had a good dinner in the all-Pinoy food restaurant known as Crisostomo Restaurant. It serves authentic Filipino cuisine with a sophisticated twist. Right from the airport we headed down here, missing all the local foods my tastebud were craving food. My family ended finishing all the taseteful dishes that are both traditionally filling and modernly mouthwatering. We ordered Bulalo with it's flavourful meaty broth peerfect with rice. You can't afford not to taste their Mango salad with fresh onions and tomatoes. Why not try their Bagoong (shrimp paste) rice just simply perfect on its own without any viand needed. We also ordered Sizzling tofu and guess what, they also serve Sizzling Balut, that was my first time and it never failed me at all. For their refreshing drinks, you can go for Green mango shake and I tell you, its worth it! It was a full loading dinner and make sure you still have enough space for desserts as they also offer varities of sinful local desserts and sweets like Sans Rival and the famous Pinoy Halo-Halo. 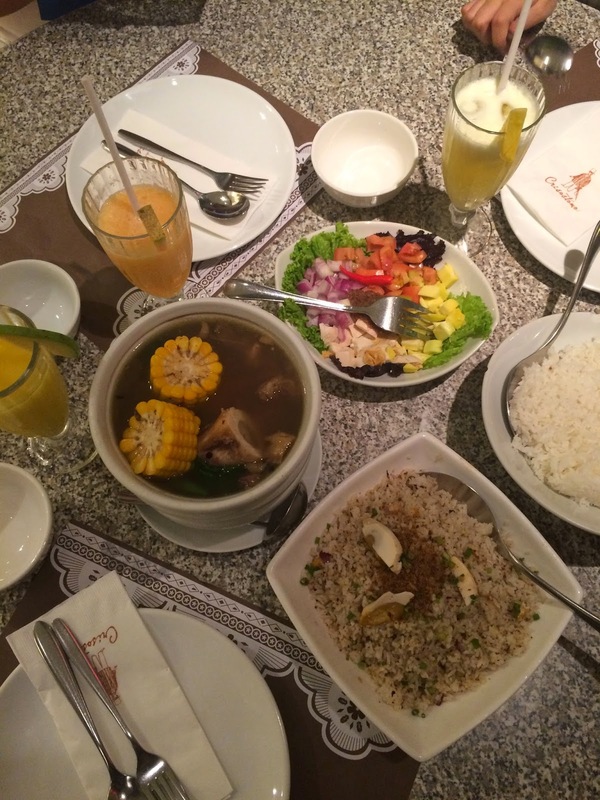 The next time you'll crave for pinoy food, Crisostomo Restaurant is the answer to it all! Sunday is my ultimate fueling day of the week. I usually do anything I want every Sunday before starting a brand new week ahead. 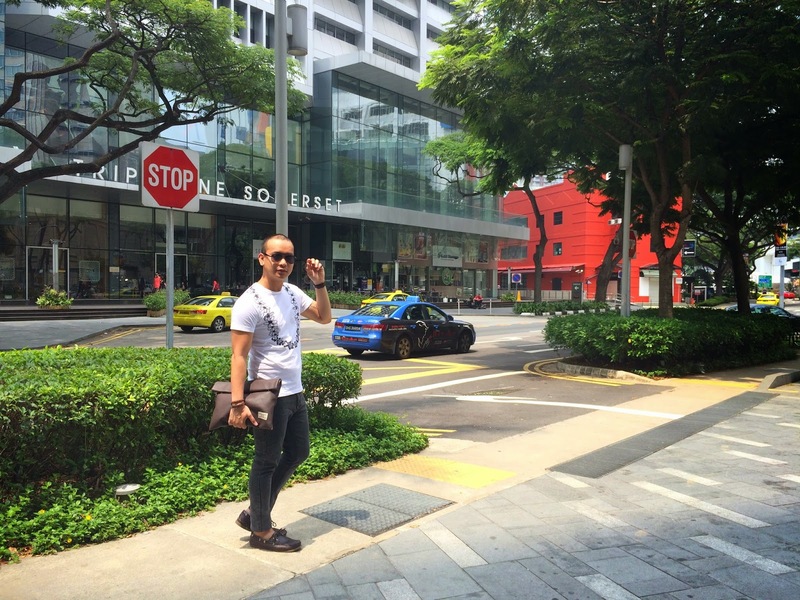 What about taking OOTD post for my fashion blog? Yes, I always do this before with my SLR and tripod with me but nowadays due to my hectic lifestyle, I usually ask random friends to take photos of me using my iPhone then edit via Snapseed and the photo quality outcome is still superb like this. I'm wearing this white floral shirt from Bench since summer is officially on. Recently, I'm overusing this Factorie black jeans as it's so easy to pair with any top plus the best fitting of this jeans on me. I'm using all brown color clutch bag, Fossil watch, Coach leather bracelet and leather Sperry shoes to complete this look. Watch out for more fashion post only here on my blog. Thanks for reading guys! Welcome to Cebu's Plantation Bay Resort & Spa! When you check their official website, you'll a logo saying "Not just a resort, but an experience." This 11 hectares of secluded grounds offers the best vacation spot and I'm lucky again to experience it when I came to Cebu City to witness the Sinulog Festival. Plantation Bay offers one of thr largest privately-owned waterways in the world, with a clean elegance of colonial-plantation architecture. If you're planning for the perfect summmer spot in Philippines, whether it will be for family vacation, romantic getaway or pleasure, you will never go wrong to visit Plantation Bay. The moment I stepped into this resort, I instantly fell in love with its tropical plantation ambience. It's simply a paradise where you can bask under the sun and completely escape from life's pressures. Plantation Bay Resort and Spa offers wide selection of rooms depending on location and presonal preferrnce and that includes Water Edge Room, Lagoon Side Room, Lagoon View Room and Poolside Room. Plantation Bay also offers Kilimanjaro Cafe, International Fiji Restaurant, Palermo Tapas and Pastas Bar, Savannah Grill, Alien Abduction for ice cream and cocktail. You can also try Mogambo Springs for spa experience, scuba diving, padi specialty course, aqua rides and even golf and tennis. Dress up or down in plaid shirt and and you will never go wrong. Plaid shirt for men will always be a trendsetter. I wore this look during a child dedication event. Since there's no dress code given, I found this perfectly tailored button-down made from the highest quality fabric from Forever 21 Men. For a defined look, go for fashion pieces that really fits you well like this plaid shirt. What I'm wearing: Plaid Shirt (Forever 21), Jeans (Folded & Hung), Loafer (Sperry), Leather Bracelet (Coach), Watch (Fossil). When it comes to Valentine Day celebration, there's nothing more appropriate that to book a room for a day of staycaytion with loved ones or even with friends for those still single put there like me. I was third wheeling again last month when I joined my friends for an overnight stay in Westin Hotel Singapore. Although this place bacame popular because of their iconic Infinity Pool and Seasonal Tastes Restaurant, you should not miss as well their Legendary Heavenly Beds- feauturing lush sheets, down cushioning and patented pillow-top mattress. Given the chance to treat yourself something, and if ever you're craving for "fine dining" desserts I have a place to recommend guys! Located along the street of Holland Village, 2AM Dessert Bar which opened again in 2007 is the best place for late night dessert treat. I love their interiors that looks so sophiticated and high class ambience but still comfortable to dine in. You can select whether you want to sit on the glass window area with tables or can even have a spot near the bar to watch how your dessert is being done. Have you tried something new this year? Have you visited a new place for the first time in your life? Or have you recently joined a festive event that bring millions of good memories thus far? Well this year, I was blessed to attend my first Sinulog Festival held in Cebu City Philippines. It was an early kick off to start my year 2015. Sinulog Festival is one of the biggest and most visited event in Philippines and considered to be one of the top festivals to attend in the country. It was one crazy and insane experience, thanks to all my Cebuano friends who all made it possible. I was lucky to experience the best of food, travel spots and acommodation in Cebu. Well this photo diary will only show you fraction of my Sinulog Festival experience. I will definitely come back here next year given the chance. A big W symbol signifying the big welcome to this much talk about hotel nestled in the luxurious Sentosa Cove neighborlurhood, W Hotel made its huge wave in Asia's hotel industry. I've been seeing this hotel chain for quite sometime now and it started when I was browsing via Agoda.com and was amazed on how beautiful was the W Hotel in Bali Indonesia. Well, got lucky again to celebrate my pre-birthday in W Hotel early this year. I'm quite lucky how many friends I have that do love staycations. Wanna see what's really W Hotel looks like from the inside? Then you better scroll down as I got you quite good photos for this blog post. We started our staycation on a high. 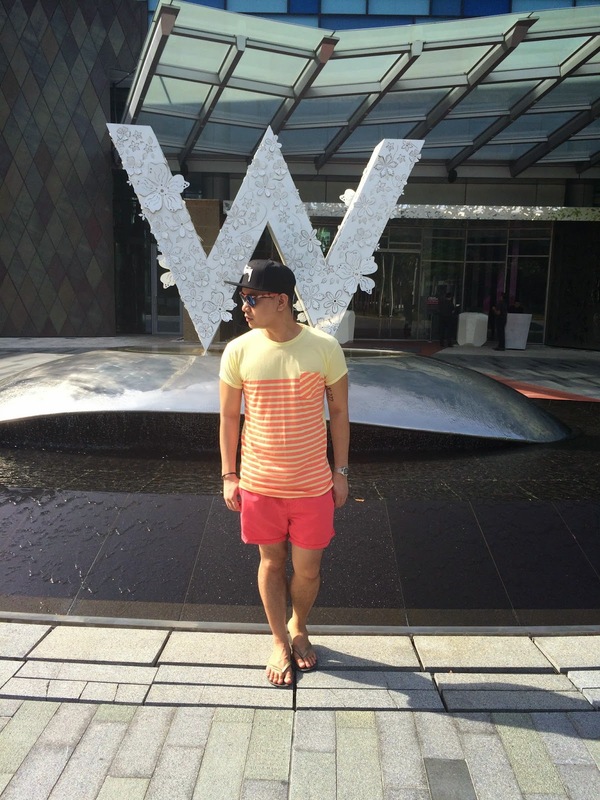 You will definitely love W Singapore's summer pool parties, WOO Bar and glamorous room interiors. Their massive swimming pool was insane, their gym is open 24 hours and their award winning SKIRT Restaurant known for steak menu offers. Even if you're not a morning person, you would still love to wake up early for a breakfast buffet. Imagine yourself chhosing on wide arrays of morning food cravings like waffle, pancakes, bacon or sunny side up? What if you can choose for even wider selections like rice, noodles, bread & patries and even cheese, fruit and cereal sections? Well you better make up your mind and in case you need a treat for yourself and planning for some celebration, there's nothing worth your decision that Seasonal Tastes by Westin Hotel. The foods here were totally instagram worthy. I just can't imagine any better meal than your chocolate wafflle or butter pancake made on spot just for you. Seasonal Taste comes with several stations with specific chef preparing the food in a fresh and presentable manner. It also comes with so much options you'll get insane not knowing what to eat in the end. Imagine having all varities of spread for your bread, various ingridients in their salad section and even yoghurts come in different yummy flavours too. 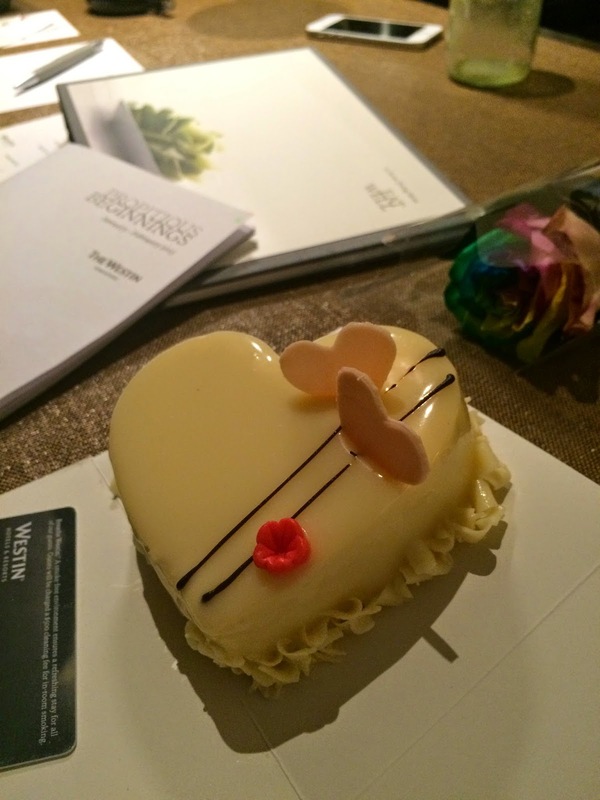 Head your way to Seasonal Tastes in Westin Hotel and I will tell you its totally worth it! Marina Bay Sands known as one of Singapore's most popular iconic structure and hotel not only in Asia but all over the world will always be on the top must visit spot for anyone visiting the Asia's most expensive city to live in. So having a once in a lifetime chance to celebrate my birthday in this famous hotel was totally awesome. Many people would always ask me how does it look like inside or how's the experience swimming on top of it's well-known infinity pool. Well let me take you inside the Marina Bay Sands and I will let you see how its totally worth it to book a room in this haven spot. I was so blessed for this birthday gift giving me a treat of MBS Club Room, an exclusive comfort with bright space that features floor-to-ceiling window. Its 61 square metees room comes with contemporary decor. It also comes with complimentary breakfast to The Club at Marina Bay Sands. You can also enjoy afternoon tea, evening cocktail and canape hour and all-day non-alcoholic beverages. Plus you'll have exclusive entry to Banyan Tree Firness Club, a state-of-the-art gym on the 55th floor. This look turned out to be my first winter OOTD on my first day in Seoul. We had so much in the outdoor crazy rides of Lotte World, one of the most visited amusement park. Although this outfit post looked winter-ready, well I was still freezing with the -2 degrees temperature of Seoul. I was wearing a red winter sporty jacket and an inside turtle neck top both from Uniqlo. I think Uniqlo will always provide some of the most fashionable winter clothes in Singapore. I used my slim cut denim jeans from Folded & Hung and paired it with my blue Nike training shoes from Royal Sporting House. To complete up my look, I scored my look by adding Billabong snap back and classic Ray-ban shades. By adding gray scarf to add accent to my look and using Givenchy classic black leather Pandora bag, this look was turned into a high-end sophisticated style where in fact it's all basic pieces combined to complete this winter look, my first experimental winter OOTD so far. On days spent around the city of Cebu during the Sinulog festival, This was my festive look- making sure that I don't lose my fashion DNA. Sinulog Festival is one of the most anticipated festival in the country with massive foreigners troop to our country to experience our colorful history. Trying to experiment with my personal style, I came up with up outfit perfect for the crazy event. I bought this black Sinulog shirt from Island souvenir and cut the sleeve to create a summer ready look. I paired it with printed board short with black & white palm tree prints from Factorie, a local brand here in Singapore. I added colorful arm candies to add color to my OOTD. I finished it off my summer sunnies from Zumeiz.com and head band to complete my look. Now I'm really festive ready. Pit Senyor Cebu! This is my last post for my Krabi travel diary. As what they say, save the best for last. If you're thinking that Thailand is just famous for their undeniably captivating beaches, we'll you don't experience what Krabi can offer to all the tourist out there. This picturesque beauty comes in abundance of nature and hidden beauty secrets. One of the best tourist spot to visit here will be the Krabi Hot Spring, yes they do have hot speing here too. What about dipping your body into naturally high water temp coming from underwater making it a natural sauna kind of mood. This place is considered to be one of the top tourist attraction here that you shouldn't miss. You moght as well try the Tiger Cave for some spiritual and physical travel challenge. I was not able to reach the cave located on top of the mountain cliffs as I'm not physically prepared for it. It will take you hundreds of steps to reach it peak so you better be dressed accordingly. Krabi was such an amazing place to unwind if you're looking for vacation spot aside from Phuket and Bangkok. When it comes to pullover style, I easily get to find myself having this basic fashion piece into my daily usual wear. It's like the safe zone between casual and formal wear. I wear this look on my way to Philippines for my birthday week celebration after I celebrated my birthday in Marina Bay Sands Singapore. So here's my look.